Adelaide-based writer with a passion for good coffee, beach walks, bike riding, the great outdoors and writing about my experiences! A weekend stroll down Brighton Jetty Road is only complete with a stop at A Cafe etc for a coffee, muffin, milkshake for the kids or a light lunch. This buzzing coffee shop, which still carries its Art Deco charm, is colloquially referred to as 'Monroe's' by regulars and it's obvious why. 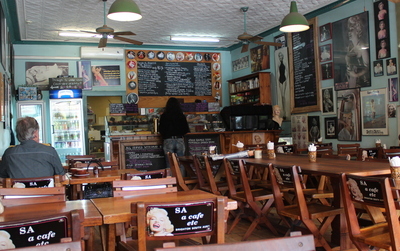 A Cafe etc is a tribute to the life of the famous Hollywood actress and model, Marilyn Monroe with one wall boasting an enormous mural of the legendary starlet. 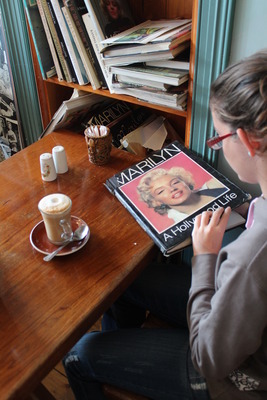 Black and white photographs of various sizes, posters, wall plates and even a book collection and other Monroe memorabilia celebrate the screen star's life and give this coffee shop its distinctive character. True to the atmosphere of Jetty Road, al fresco tables on the footpath are ideal for a lovely sunny morning and inside seating is cosier in cooler weather. A covered courtyard out the back is suitable if you're after a quiet spot or even a private function. The beverage range, which includes a wide selection of organic coffee, is extensive, and includes kid-friendly milkshakes, while the breakfast and lunch menus offer excellent value for money. Foccacia, baguettes and bagels at $11.90 are all served with salad and include a chicken breast, leg ham, turkey breast and vegetarian option, while the Bruschetta, priced from $7.90 - $9.90 also includes various vegetarian options. The menu includes moussaka, homemade lasagne and gourment pizza as well as savoury crepes, frittata, filo, pies and quiches and homemade Cornish pasty. Younger tastes aren't ignored at A Cafe etc, with pizza and milkshakes – including a cherry ripe-flavoured option – and fruit salad with yoghurt on the menu. 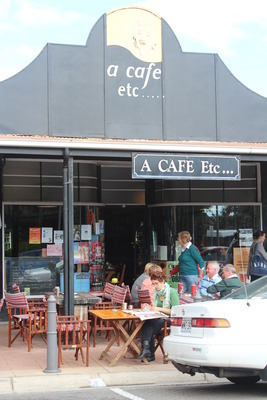 A Cafe etc is open seven days a week from 8:00am to 5:00pm.